Renderings of the anticipated renovations to the EDCJCC. Your gift, along with those of other EDCJCC donors, will allow us to provide thriving, dynamic, and relevant Jewish experiences in a modern, secure, state-of-the-art building for generations to come. We will create new spaces for the community to gather, enhance operations and security, and take steps toward making the buidling more energy efficient. A second flexible arts space with retractable theater seats will support our world-class culture and arts programs. 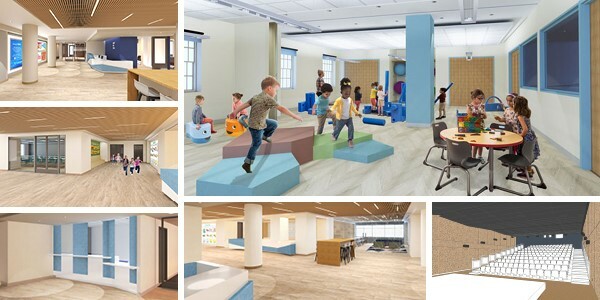 New spaces will include brand new classrooms, a dedicated elevator and stairway to enhance security for the preschool, and expanded outdoor and indoor play spaces. As stewards of this historic building, we are creating an endowment to ensure the upkeep of the building and programs for generations to come. Please consider joining our $20+ Million Campaign by filling out the secure form below. For major gifts, additional naming opportunities, or questions, contact Emily Jillson, Director of Development and Marketing, at emilyj@edcjcc.org or 202-777-3231. Learn more about the EDCJCC during the renovation year.